Apostrophes, brackets, colons, commas, dashes, ellipses, exclamation marks, full stops, guillemets, hyphens, question marks, quotation marks, semicolons, slashes. In brief: Punctuation. What would we do without those little symbols that organise our words on paper, that indicate intonation and thus meaning, essential to disambiguate sentences? Earliest alphabetic writings had no capitalisation, no spaces, no vowels (i.e. today’s Abjad writing system) and very few punctuation. In ancient Greece and Rome, symbols were used to mark where speakers should pause; the longest section (the period) was divided by the ‘period’ pause – hence a ‘period’ mark –, the shortest section (“that which is cut off”) was divided by a ‘comma’. When the Christian Bible started to be copied and translated (around 400AD), an early punctuation system was developed. 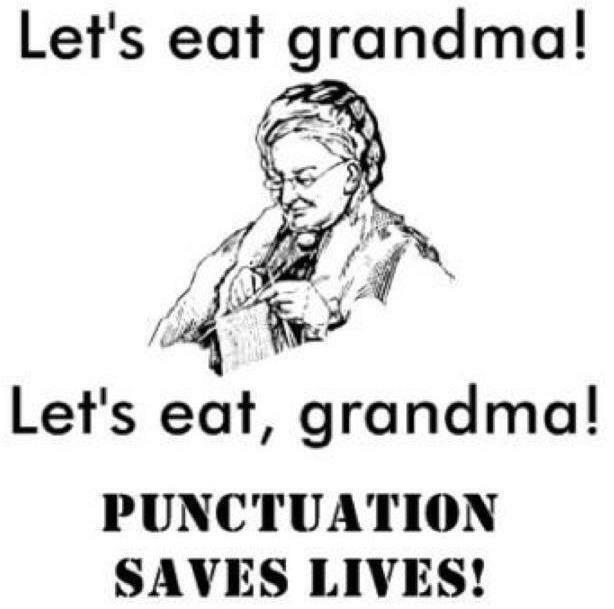 Only when printing was introduced in the 15th century however, punctuation became more common and systematic. Nowadays, punctuation varies across languages, register, and authors may (not) use it for a specific stylistic style. While punctuation may facilitate comprehension, the lack of it may facilitate ambiguity – which must not be a bad thing at all. Have a good day. There’s nothing more to say, just give me time to breathe. Well, something along those lines. Makes the whole story much more interesting, don’t you think!? Dale, R. 1991. The role of punctuation in discourse structure. In Proceedings of the AAAI Fall Symposium on Discourse Structure in Natural Language Understanding and Generation, 13 14. USA. Lee, S. 1995. A syntax and semantics for text grammar. MPhil. Dissertation, Engineering Dept., Cambridge University. This entry was posted on 11/08/2012 by G in Academia, Linguistic Musings and tagged orthography, punctuation, writing, writing system.